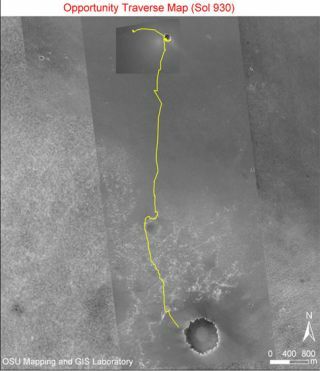 The latest map shows the trail of the Opportunity Mars rover as it draws closer to a major milestone, Victoria Crater, in its journey across the red planet. Scientistsand engineers are enjoying success both on the surface of the red planet and inorbit around Mars. NASA'sOpportunity Mars rover is closing in on the huge Victoria Crater at MeridianiPlanum. The robot has rolled into position nearby to make "rim shots"--using itscameras to take longing looks at the crater's opposite wall. Ithas been an arduous 20-month trek for the Mars machine to pull up to thesprawling Victoria Crater--equivalent of eight football fields placed end to end--agoal hungered by researchers since late 2004. "We'recurrently about 50 meters [164 feet] from the rim of Victoria crater," saidSteve Squyres, lead Mars Exploration Rover scientist from Cornell University in Ithaca, New York. Squyresdescribed to SPACE.com the scene ahead and locations that are likely tobecome very familiar in the days to come. The closest point on the rim is analcove that rover team members call Duck Bay. Immediately to the left(northeast) of Duck Bay is a promontory named Cape Verde. To the right (south)of Duck Bay is another promontory named Cabo Frio. "Wewill first reach the rim of Victoria at Duck Bay, with good views from there of Cape Verde, Cabo Frio, and much of the crater interior," Squyres said. Onceat that location, the rover will use its set of navigation cameras, as well asacquire portions of the landscape with its Panoramic Camera, as well as utilizeto some degree its Mini-Thermal Emission Spectrometer, or Mini-TES. Thisinstrument sees infrared radiation emitted by objects. Theprimary purpose of all this remote sensing will be to select the location for abig Panoramic Camera picture-taking session, Squyres explained. "I expect thatthe site we select will be either the tip of Cape Verde or the tip of CaboFrio...but we'll see." Squyresadded that Opportunity will be driven to the chosen panorama location, fire upits Panoramic Camera "and take the coolest picture of the surface of Marsyou've ever seen." "Thereal promise that craters give us is that they allow us to view into the 3rddimension," said David Des Marais, an astrobiologist at NASA's Ames Research Center at Moffett Field, California. He is a science team member for Opportunity and its twin, the Spirit Mars robot--also busy at work at Gusev Craterelsewhere on the planet. "Somuch of the landscape we have seen at Meridiani has been a flat expanse that wehave driven across," Des Marais told SPACE.com. Victoria Crater givesscientists a window down into the subsurface on Mars...as well as a view into theplanet's history. Thanksto Victoria Crater, rover scientists can study, for example, how long a wateryenvironment may have existed at that locale. Furthermore, did it persist longenough to be able to sustain life as we know it? "Sortof like a tape recorder--they've been recorded into the walls of VictoriaCrater," Des Marais said. Thegeneral attack plan for the 2,625 feet (800 meters) wide crater is to first mapout the terrain that's inside the feature. A large dune field is at the bottomof Victoria. Opportunity is approachingthis tantalizing target, generally from the northwest. However,preliminary evidence from orbit indicates that southeast of the craterrepresents perhaps the most approachable trajectory to get inside the crater--ifthat go-ahead is given. "Sofasten your seat belts," Des Marais suggested. "It's going to be a few months hereas we move around...take pictures from a few vantage points to get a nice map ofthe entire crater. And then there's the key decision about to go in or not togo in...and where," he added. DesMarais said that there are important discussions to take place over the nextfew months: Is there enough science value by driving into Victoria Crater? Ifso, is that research of first-rate importance if rover handlers can't wheel Opportunity back out? "Theseare all very fundamental decisions that are going to have to be confronted,"Des Marais concluded. Meanwhile,sweeping high above Mars is NASA's Mars Reconnaissance Orbiter (MRO). There'sgood news with this spacecraft too. Earthcontrollers have deployed the probe's SHAllow RADar (SHARAD) antenna, anexperiment provided by the Italian Space Agency and built by Astro Aerospace, abusiness unit of Northrop Grumman's Space Technology sector. SHARADwill probe Mars' subsurface via radar waves to depths of about six-tenths of amile (one kilometer) to find and map layers of ice, rock and, if present,liquid water. Theradar received its first radio echo from the Martian surface during a test onSeptember 18, a checkout that verified the entire instrument is workingproperly. MRO'stwo-year-long main science phase will begin in November, making use of an arrayof science gear, including ultra-powerful camera systems. Latelast month, ground controllers successfully brought to an end a six-month-longcampaign of dipping in and out of the planet's thin atmosphere. That technique,called aerobraking, nudged MRO into a desired working orbit around the redplanet.